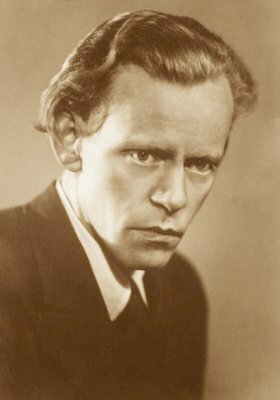 Steinn Steinarr (born Aðalsteinn Kristmundsson, October 13, 1908 – May 25, 1958) was an Icelandic poet, born on the farm Laugaland near Kaldalón in Ísafjarðardjúp fjord. Many Icelanders regard Steinn Steinarr as their greatest poet. Yet he remains almost unknown outside his country. The reason is simple; effective translations of his poetry have been virtually nonexistent. In 2008, 100 years after his birth and 50 years after his death, things are finally about to change. Not only is he wildly popular among Iceland’s youth, but international interest in his poetry is growing. His farm laborer parents were servants on farms in the Snæfjallahreppur and Grunnavíkurhreppur parishes in the beginning of the 20th century. They finally settled on the farm Laugaland in Nauteyrarhreppur parish where Steinn was born, but they were so poor that the local authorities divided up the family when Steinn was only two years old. The three oldest children were shipped off for adoption (during which the oldest died). The rest of the family was escorted off to a farm in Dalasýsla county, where Steinn was adopted by Kristín Tómasdóttir on the farm Mikligardur in Saurbæjarhreppur parish. A beloved Icelandic poet, Stefán frá Hvítadal, happened to live in his parish. When he heard some of the boy’s “poetry” he urged his foster family to encourage him. One of his teachers, a talented young poet, Jóhannes úr Kötlum, agreed. But in 1926, at the age of 18, Steinn moved to Reykjavik. Penniless and friendless in the fast-growing capital he was determined to make good. Despite his aversion to physical work he swallowed his pride and labored day and night in the burgeoning building industry. His reward was a serious attack of polio that left him with a paralyzed left side. In 1933 Steinn published his first book of poetry. He called his work The Red Flame Burns (Rauður loginn brann) and got a glowing reception from Iceland’s working classes. In 1948, he married Ásthildur Björnsdottir. The same year his masterpiece, Time and Water (Tíminn og vatnið), was published, securing his reputation as Iceland’s foremost modern poet. Steinn Steinarr is sometimes considered the first important Icelandic modernist poet, but he also had a good command of traditional Icelandic poetics.